We've a new study today appearing in the Journal Cell Stem Cell, that adds to the growing weight of evidence that the Zika virus is neurotopic - and that under the right conditions - it can cause severe brain damage. In this case, researchers injected the Zika virus directly into fetal mouse brains at a time corresponding to the 2nd trimester in humans, when neural progenitor cells are expanding and creating new neurons. Mouse fetuses injected with the Asian Zika virus strain and carried to term within their pregnant mothers display the characteristic features of microcephaly, researchers in China report May 11 in Cell Stem Cell. As expected, the virus infected the neural progenitor cells, and infected brains reveal expression of genes related to viral entry, altered immune response, and cell death. The authors say this is direct evidence that Zika infection causes microcephaly in a mammalian animal model. "The most surprising part of this study is that it was mostly neural progenitor cells that got infected in the beginning and mostly neurons that became infected at a later stage--5 days after injection when the presence of Zika virus increases several hundred folds." says co-senior author Xu. 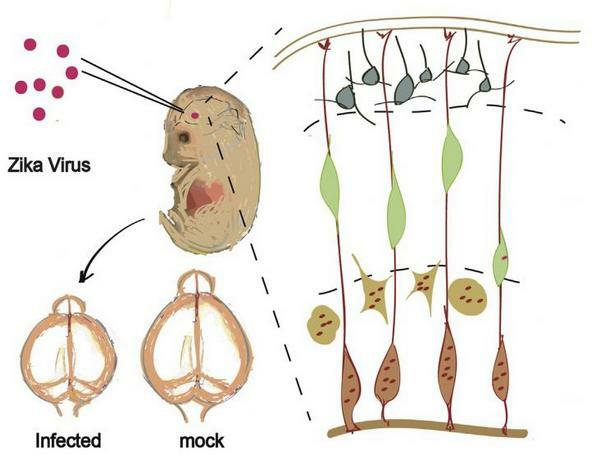 "However, almost all cell death was found in neurons other than neural progenitor cells. This indicates that neurons, but not neural progenitor cells, are prone to induced cell death by the Zika virus." "Mice are not humans, and we need be careful when translating our findings into human disease," says Qin, the other co-senior author on the paper. "Extensive experimental and clinical investigations are urgently needed in response to this global crisis." "Our animal model, together with the global transcriptome datasets of infected brains, will provide valuable resources for further investigation of the underlying cellular and molecular mechanisms and management of Zika virus-related pathological effects during neural development," Xu says. The full study can be accessed at the link below. The link between Zika virus (ZIKV) infection and microcephaly has raised urgent global alarm. The historical African ZIKV MR766 was recently shown to infect cultured human neural precursor cells (NPCs), but unlike the contemporary ZIKV strains, it is not believed to cause microcephaly. Here we investigated whether the Asian ZIKV strain SZ01 could infect NPCs in vivo and affect brain development. We found that SZ01 replicates efficiently in embryonic mouse brain by directly targeting different neuronal linages. ZIKV infection leads to cell-cycle arrest, apoptosis, and inhibition of NPC differentiation, resulting in cortical thinning and microcephaly. Global gene expression analysis of infected brains reveals upregulation of candidate flavirus entry receptors and dysregulation of genes associated with immune response, apoptosis, and microcephaly. Our model provides evidence for a direct link between Zika virus infection and microcepahly, with potential for further exploration of the underlying mechanisms. While the murine (mouse) model may have some limitations with respect to viral behavior in human brain tissue, this study builds on earlier research papers we've seen that describe Zika virus replication in brain tissues, and subsequent severe damage.